Simplicity was considered bland and ordinary in a time when only outlandish designs and brand-new technology were the pinnacles of innovation. But when it comes to home appliance design, subtle might not be such a bad thing after all. Samsung Electronics found Flat Style as the perfect way to understand and interpret the essence of a product in terms of simplicity rather than complexity. Flat Style, the design on which possibilities of diverse experiences for users are finely stacked up, is now redefined beyond the dictionary definition of ‘pedestrian’. Flat Style first begins with minimalism, which is about seeking completion in simplicity. The flat, handle-less refrigerator door reminds us of the beauty inspired by simple lines and clear-cut surfaces. This is the result of relentless contemplation on the essence of kitchen appliances as a visual component that brings completion to the kitchen space. Indeed, Flat Style pursues harmony with space. The straight lines of the wall, floor, and kitchen counter become one with the flat frontal surface of the refrigerator. The refrigerator’s size has been designed with the depth of the kitchen counter in mind, so that the fridge fits in perfectly without any protrusions when it is placed in the kitchen’s fridge cabinet. 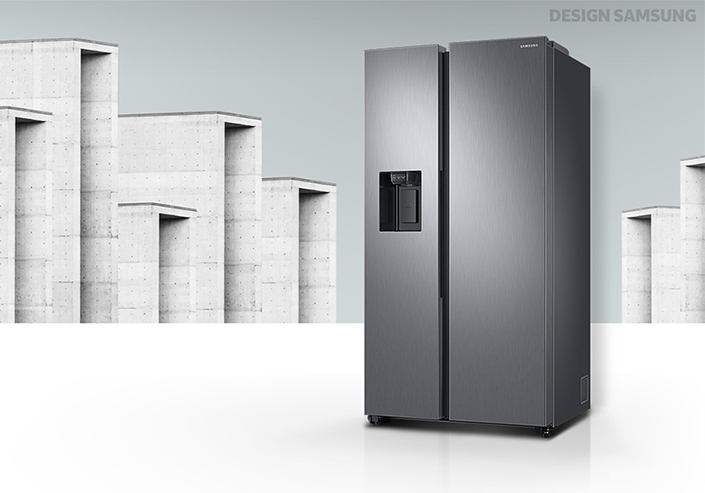 Furthermore, the refrigerator is designed with convenience in mind, allowing users to comfortably open and close the fridge door even when it’s placed inside the cabinet. 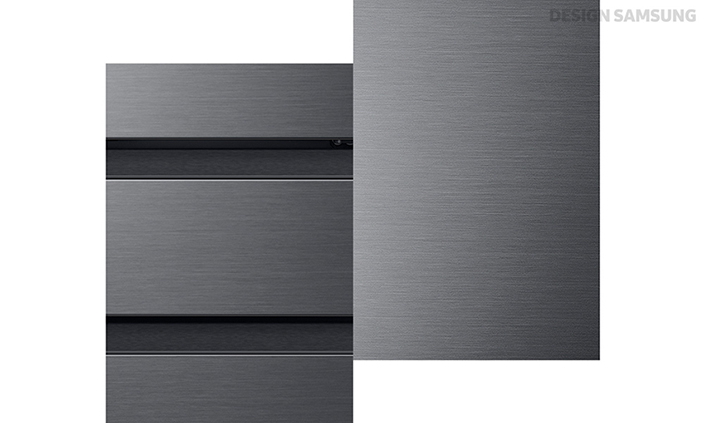 Look at the stainless-steel finish that has been applied over the exterior of the refrigerator. The use of Flat Style here adds credibility to the kitchen with its sturdiness. The metal helps maintain exceptional durability and elevates the classiness of the space it occupies with its exquisite and delicate glow. The handle and internal shelves of the fridge have also been designed to continue the metallic look and feel, altogether establishing a consistently solid impression of the refrigerator overall. Flat Style adds an aesthetic taste to a kitchen appliance as if it were a piece of sculpture. The exterior of the refrigerator has been instilled with the aesthetic beauty that is derived from simple forms so that its design blends well with modern interiors. The placement of the door and handles that resemble the majestic skyline of high-rise buildings creates an image of two pillars vertically stretching down to form a Column design. With just the bare minimal combination of such simple lines, you can feel a sense exquisite class. 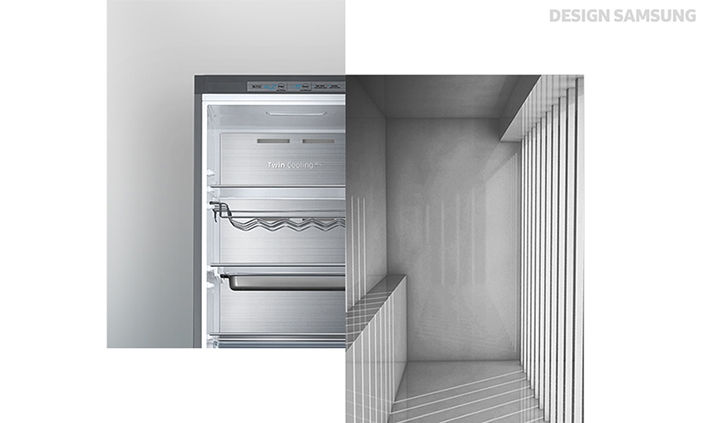 There’s a seamless flow that comes with designing kitchen appliances with Flat Style. It’s a sense of cohesion that is evident from the insides to the outer edges of the exterior. The Flat Style strives for simplicity, and this notion is reflected in the fine details of the internal design. The corners of the internal space are shaped closely to a perpendicular angle to form a spatial form composed of straight lines, which maintains the aesthetic simplicity of the exterior body. Simply put, Flat Style makes the final touch on the consistent aesthetic appeal that penetrates the product from the inside-out. As stunning as the refrigerator is, it’s important that everyday usability is always considered from the outset. The little things can make a big difference. Controls that aren’t frequently used have been relocated to the inside of the refrigerator to remain out of sight. The water dispenser is also simplified to only feature buttons for frequently used functions such as choosing between water or selections of ice, while the rest of the functions are combined with the internal display. 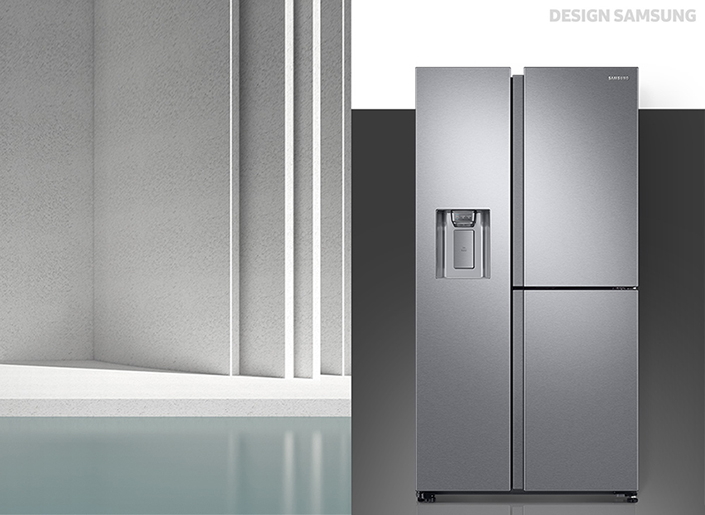 The RB8000’s Kitchen Fit design minimizes the thickness of the refrigerator door while securing 100L more in max capacity compared to other refrigerators of the same size. In addition, the RS8000’s slanted shelf handles are applied with oblique strokes for users to comfortably pull the shelves without hurting their wrists. In a world filled with unconventional, unique ideas and over-to-top expressions, the power of simplicity becomes more prominent. Samsung Electronics strives for functional designs that express beauty in the essence of things and simplicity conveyed through perfect form that prioritizes the fundamentals. 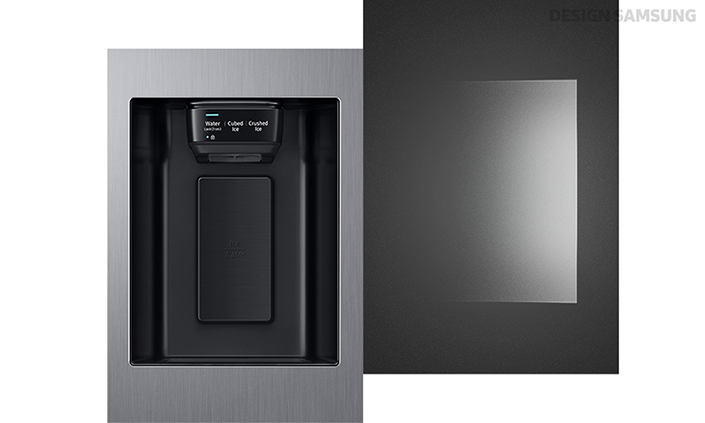 Samsung’s definition of Flat Style is a kitchen appliance that organically communicates and harmonizes with its space through pure and timeless simplicity that is free of all complications.